I have to admit, when I first visited San Sebastian a few weeks ago, I had no idea what exactly a pintxos bar crawl entailed. How many pintxos do I order from each bar? How do I order? Will they speak in English? These were many of the questions I was left with. To make things more difficult, one of the first pintxos bars I visited – La Cuchara De San Telmo – had no pintxos on display, only a blackboard scrawled in Spanish with the daily specials. The waiter drummed his pen impatiently on the notepad while he waited for me to order. “What would you recommend was my reply? ””Cheeks, foie and tuna” he responded. “Ok I will go for that”…. Let’s not lie; pintxos bar crawling is not the most relaxing dining experience you’ll find. It’s fast and furious, as you wrestle with your neighbours to try to get a place at the bar. And don’t expect a seat. By the time I finally got used to the frenetic ordering system it was time to leave. So I thought I would put together a few hints to all those pintxos bar crawling amateurs (like me!) out there. Usually pintxos bars have a few specials they are famous for in-house. At La Cuchara de San Telmo don’t miss the foie and cheeks, while at Bar Goiz Argi order the grilled squid and prawns. But don’t over research; a bit of spontaneity is part of the fun! If you’re in doubt ask the waiters; usually they are more than happy to help. To avoid massive queues, try to get to your favourite spots soon after opening. House specialties often sell out early in the night. Bar Nestor has a huge waiting list at peak times, so make sure you get there early to put your name down on the waiting list and reserve a slice of their delicious tortilla. In most bars, the cold pintxos are laid out on the counter. It’s common practice to grab a plate, load it with pintxos and show the bartender your order (most pintxos are priced between €2 – €5 each.) But in some of the best pintxo bars like Borda Berri, all pintxos are made fresh to order. If you’re visiting a pintxos bar for the first time, it’s a good idea to ask if they have a menu available in English, otherwise you can try your hand at deciphering Spanish from the blackboard specials. Traditionally, pintxos are accompanied with a glass of txakoli – s sparkling, dry white wine from the region. It’s usually poured from a height to aerate the wine and create more bubbles – a spectacular sight!It’s also popular to order a “zurrito” – a small pour of the house draft beer or a “txikito, ” a small glass of “tinto” (red wine) or “blanco” (white wine). If you’re looking for something extra special, ask for a “crianza” red wine, which has been aged for two years with at least six months in oak. During a pintxos bar crawl, most people only order a couple of pintxos at each place, picking out the best specialties from each bar. It’s a good idea not to stock up too much in one place. Part of the fun is moving from one place to the other during the evening. After all you can always come back to your favourite again the next day. It’s not rude to use your hands at pintxos bars. Since most pintxos are just over bite sized, cutlery usually isn’t necessary.The way you dispose of your napkins after eating is a true test if you’re a local or a tourist. If you’re looking to fully embrace the Basque culture, raise your napkin in the air and throw it to the ground under the bar. Don’t worry you won’t be thrown out. The more dramatic the better! 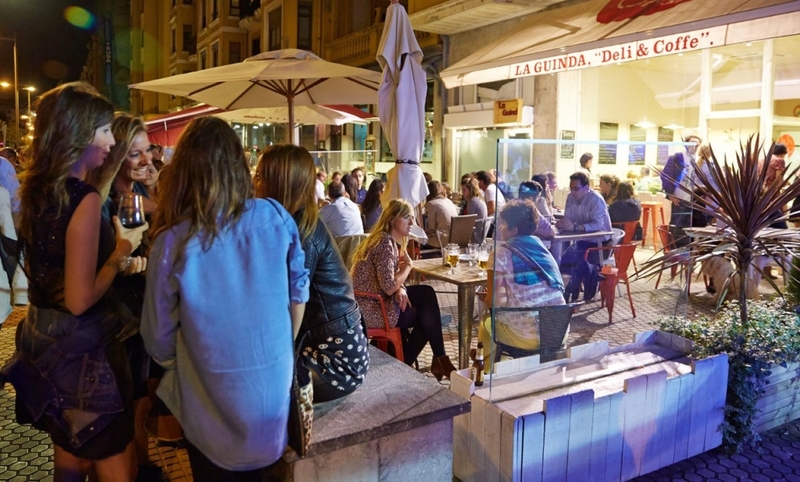 Leave your shyness at the door at pintxos bars and be prepared to wrestle with your neigbours to get to the bar or holler your order to the waiters over the bar. Don’t take it personally if the bartenders are rude or abrupt; it’s part of the business here. Just order what you want at the bar and pay at the end. In most cases the waiters have an incredible memory and will remember what you ordered without a reminder. Unless you reserve a table or are eating in the restaurant section of the pintxos bar, don’t expect a seat. At most pintxos bars, it’s standing room only. At best you are lucky to get a standing room spot inside the bar. Keep the stilettos at home and trade them for comfortable flats. And don’t forget to check out my guide to The Best Pintxos Bars in San Sebastian.